I have finished this cute little bear just right before Christmas. but it doesn't have pattern, only 3 different colour of short pile mohair -- brown, green & red. 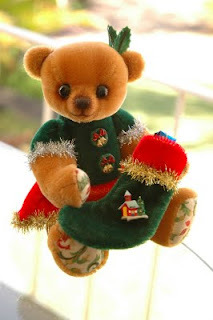 We have to use these 3 colours of mohair to make a bear with X'mas theme.I designed the pattern, choose the eye size, joints and paw pads.And here she is, "Joy Holly". She is about 20 cm height, has black glass eyes, 5 ways lock nut joint sets, wool stuffing with X'mas theme paw pads.As I want her to free stand, I used a lot of garnet powder in her both legs. 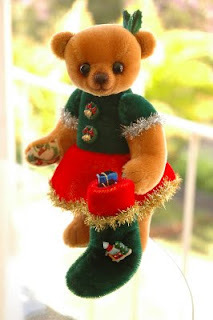 She is wearing a green Tee with 2 big Christmas buttons, with silver tinsel ribbon around the arms. As well as a red skirt with gold tinsel ribbon. Both of her ears also have bells in there, the bells will ring when you move her. Oh! And she is also carrying a Christmas sock, and wow! She got a gift from Santa! Hi Bonnie, I want to follow your blog but though Blogger. Can you put that link on here too? 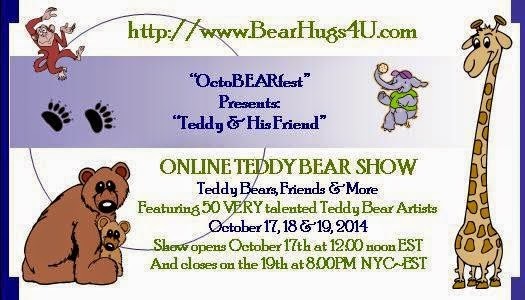 Complimenti, fai bellissimi teddy bears !